Random numbers are the lifeblood of crypto but are often taken for granted. Poor randomness makes keys more predictable and weakens security. Getting random number generation right is already a challenge, and in the virtualized world of cloud computing and constrained devices of the IoT, the situation is likely to get worse. Join our live webinar to learn how you can easily upgrade your systems to take the uncertainty out of random number generation. When devices in the Internet of Things (IoT) handle sensitive data or perform safety critical tasks, it’s essential that they can be trusted. Devices need to be able to store data and communicate confidentially. They need to prove their identity and verify that messages they send and receive have not been tampered with. These critical security capabilities all rely on cryptography – and all cryptography relies on secrets. Whether using encryption, digital IDs or signatures keeping secrets is still only a part of the challenge. Implementing the core crypto algorithms and protocols can be error prone, resource hungry and slow in operation – all of which can impact user confidence and vendor credibility. 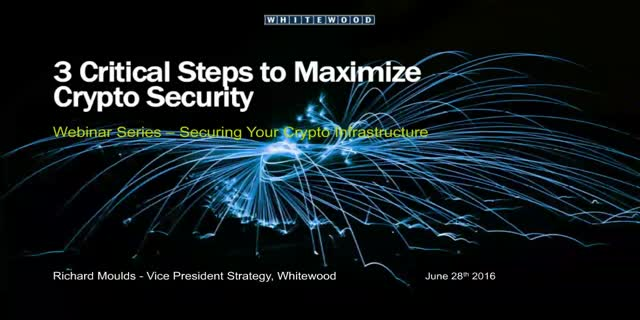 During this webinar, experts from Whitewood and wolfSSL will highlight the pitfalls and solutions for crypto enabling your IoT security to build trust, minimize risk and accelerate time to market. Random numbers and the entropy they contain is the foundation of secure cryptography. Yet, providing sufficient random numbers and entropy with assurances that it cannot be known, monitored, controlled or manipulated by others has proven to be remarkably difficult. How do you know if your random numbers are truly random, and how can you insure that your security system is secure? The importance of cryptography in the security systems continues to increase, and has become a mainstream issue. Yet it is a complex topic that is misunderstood by many. This 60 minute webinar reveals important new research into common pitfalls and misconceptions about crypto security. Originally presented at Black Hat 2015, this session discusses how random numbers and entropy are generated and how they are consumed by the most common crypto applications and protocols including SSL/TLS. Attendees will have the opportunity to ask questions about the research and gain a better understanding of what’s really going on with random number generation in their own systems and assess the practical impact on the their overall security posture.